Orthodontic treatment is a big investment. But given the benefits for future good health and a more attractive smile, it's well worth it. In the here and now, though, braces wearers face a different threat to their dental well-being — dental disease. Wearing braces can actually increase the risk of disease and make it more difficult to fight. Tooth decay and periodontal (gum) disease, the two most common forms of dental disease, usually arise from plaque, a thin film of bacteria and food particles on tooth surfaces. The bacteria produce acid, which erodes enamel and makes the teeth susceptible to decay. Certain bacteria can also infect the gums and eventually weaken their attachment to teeth. Thorough brushing and flossing everyday removes this disease-triggering plaque buildup. But braces' hardware can make brushing and flossing more difficult. The brackets attached to the teeth and wires laced through them make it more difficult for floss and brush bristles to access all the areas around the teeth. Plaque can build up in certain spots; it's estimated braces wearers have two to three times the plaque of a person not wearing braces. Acid can also remain in contact with some of the enamel surface for too long. 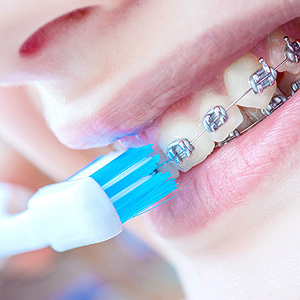 It's important, therefore, if you wear braces to make a concerted effort to brush and floss thoroughly. Besides improving technique and taking more time, you might also consider additional aids. You can obtain toothbrushes specially designed for use with braces, as well as floss holders or threaders that make it easier to access between teeth. Another flossing alternative is an oral irrigator that sprays water under pressure between teeth is an alternative to flossing. As a precaution against acid damage, we can boost enamel protection with additional fluoride applied to your teeth. We may also prescribe antibacterial rinses to keep the bacteria population low. Above all, be sure to look out for signs of disease like swollen or bleeding gums or pain. As soon as you sense something out of the ordinary, be sure and contact us.